Whether you are in need of a completely new walkway or you just want to revamp your existing one, the team at Design West Landscaping is the right company for you. Let us add some extra appeal to your residential or commercial property and watch your property become the envy of the entire neighborhood. If you live in the Northern San Joaquin Valley and East Bay area's then let us take on your next project. Servicing Lodi, Stockton, Dublin, Elk Grove, San Ramon, Livermore and neighboring cities in California. If you want to give your walkway a unique edge, then why not consider using flagstone? It is a lovely natural stone that is really gaining popularity in the hardscaping industry for its durability and timeless beauty. It can add a classic and elegant appeal to your home or business property. Let the team at Design West take your landscapes to the next level. Concrete doesn't have to be the old boring grey type anymore. There is a wide range of decorative concrete options to choose from nowadays like stamped, stenciled, engraved and colored concrete. This material is sure to make a stunning statement to any walkway feature. Talk to us today for all the information on the concrete options available. When it comes to the design of your walkway the team at Design West Landscaping can show you a wide range of innovative designs and ideas. Feel free to browse through our project gallery to see some of our stunning creations. Our designers will sit down with you and work out the best design for your property, your requirement and of course for your budget. Your design can vary when it comes to shapes, patterns, colors and different materials. The options are endless! 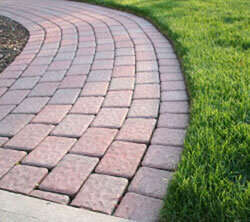 At Design West Landscaping we are affiliated with Belgard and Pavestone. These two paver manufacturers have a vast range of pavers that are beautiful and are produced to the highest of standards. So let us install a walkway that is not only aesthetically pleasing but one that is durable and will stand the test of time! Contact us today and our team of professionals will take all the stress and hassle out of your new project. Let us get started by providing you with a personal consultation!